Supports all VGA monitors including analog flat panel TV's, Projectors, high resolution desktop computers, graphic workstations, etc. 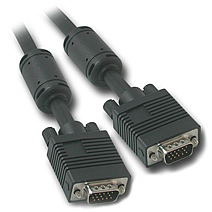 These are our high-quality VGA cables, capable of supporting today's higher VGA resolutions. Resolutions obtained are still dependant on the video mode supported by your video card and monitor. Now you can place your monitor where you want to place it! Ferrited and Double Shielded, monitor cables can go the distance without Ghosting and Signal Distortion. They are truly worry free since they are constructed with premium grade composite coaxial and twisted pair shielded cables. Going 100ft and beyond...no problem. These monitor cables ensure crisp, distortion free video so you have maximum monitor positioning flexibility. These ultra-premium monitor cables are ideal for video presentation devices, video splitters, and KVM switches. 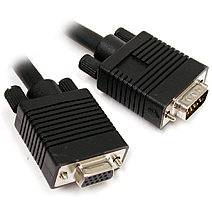 Premium VGA Monitor extension cables are ideal for video presentations, classroom environments, POS, server rooms, or just for organizing your work area for maximum comfort and efficiency.